Ships tomorrow if you order in the next 19 hours 32 minutes. Even though dogs require a number of vitamins, minerals, proteins, and other nutrients for optimal health much like humans do, many dog food offerings are less than desirable and may not contain everything your dog needs to a long, healthy, and happy life. 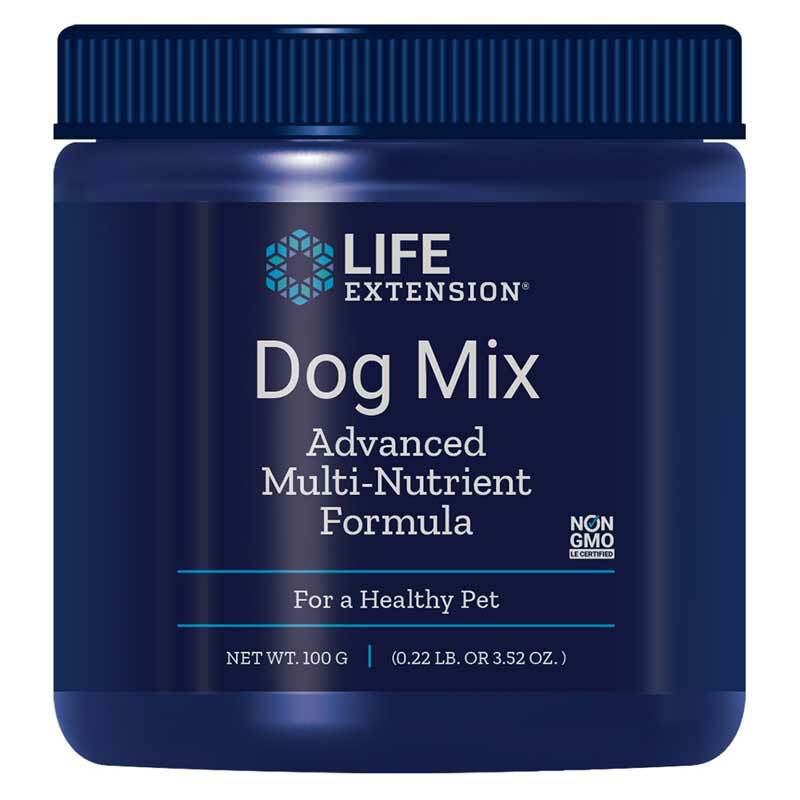 Dog Mix from Life Extension is a blend of vitamins, minerals, antioxidants, amino acids, probiotics, essential fatty acids, and other nutrients that are essential for dogs. Your dog gives you unconditional love. Do the same in return! Make sure your dog has everything he or she needs to live a fruitful, happy, healthy, and long life. Order Dog Mix from Life Extension today and keep your dog healthy. 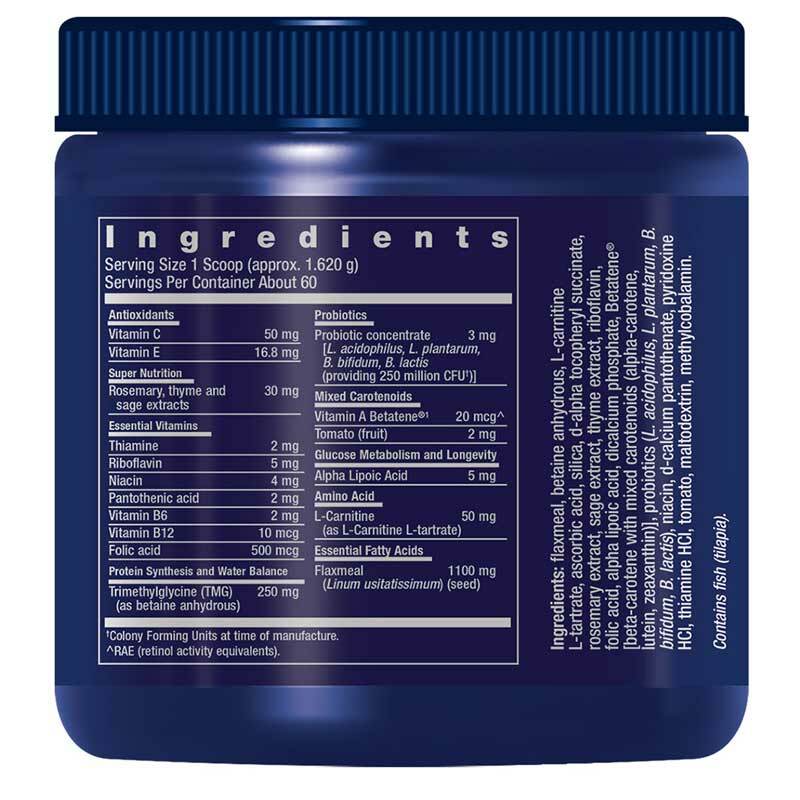 Ingredients: flaxmeal, betaine anhydrous, L-carnitine L-tartrate, ascorbic acid, dicalcium phosphate, silica, d-alpha tocopheryl succinate, maltodextrin, rosemary extract, sage extract, thyme extract, riboflavin, alpha lipoic acid, niacin, Betatene [beta-carotene with mixed carotenoids (alpha carotene, lutein, zeaxanthin)], niacin, d-calcium pantothenate, pyridoxine HCl, thiamine HCl, tomato, folic acid, probiotics (L. acidophilus, L. pantarum, B. bifidum, B. lactis), methylcobalamin. For dogs weighing 20 to 30 pounds: mix one scoop a day into your pet's food or a treat. Adjust amount according to weight. Refrigerate after opening. Density may vary. This product is not meant to replace veterinary care. Any animal not responding to nutritional therapy should be seen by a licensed, competent veterinarian. Always inform your veterinarian if your animal is taking a supplement. Keep out of the reach of children. Do not exceed recommended dose. This Dog Mix is of a very high quality, and I've been using it continually for 1 year & I have seen incredible results in every area of my dog's health! I had tried many kinds of vitamin supplements over the years and this one is the best!